Hamilton County Schools Superintendent Bryan Johnson gives a "State of the System" address at Chattanooga School for the Arts and Sciences on Thursday, Feb. 7, 2019, in Chattanooga, Tenn. Johnson shared the current state of the school system and his outline for the future in an address to the community. In a show of partnership with the county and the business community, Hamilton County Schools Superintendent Bryan Johnson shared the stage during his State of the System address Thursday with county Mayor Jim Coppinger and Christy Gillenwater, president and CEO of the Chattanooga Area Chamber of Commerce. "I firmly believe that the best days of Hamilton County Schools are ahead," Johnson said as he began the address, which highlighted areas of success and challenges that the school district faces and focused on the "promise," or commitment, the district has to every child. 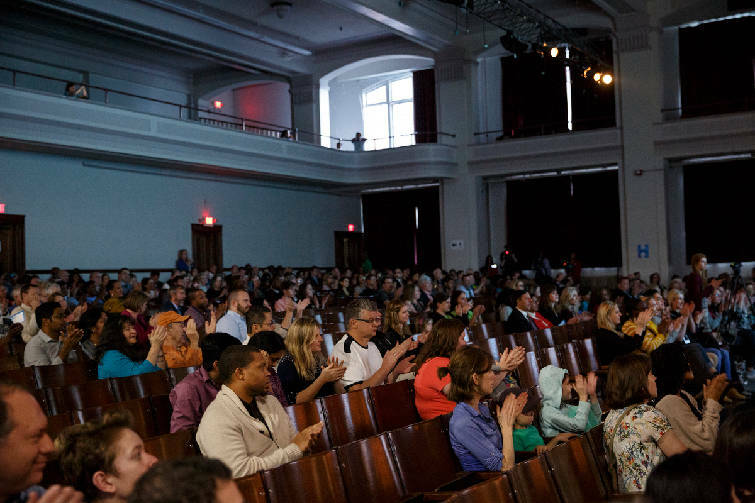 Guests applaud during a "State of the System" address at Chattanooga School for the Arts and Sciences on Thursday, Feb. 7, 2019, in Chattanooga, Tenn. Hamilton County Schools Superintendent Bryan Johnson shared the current state of the school system and his outline for the future in an address to the community. "We want to talk tonight about promise. The promise that exists within our school system," Johnson said. "We want kids to reach their highest and fullest potential." That promise includes many of the goals outlined in the district's five-year strategic plan Johnson has been touting for several months since the school board adopted it last fall. The goals include increasing the number of students reading on grade level, passing Algebra I, taking advantage of advanced courses to prepare them for life after high school and graduating on time. 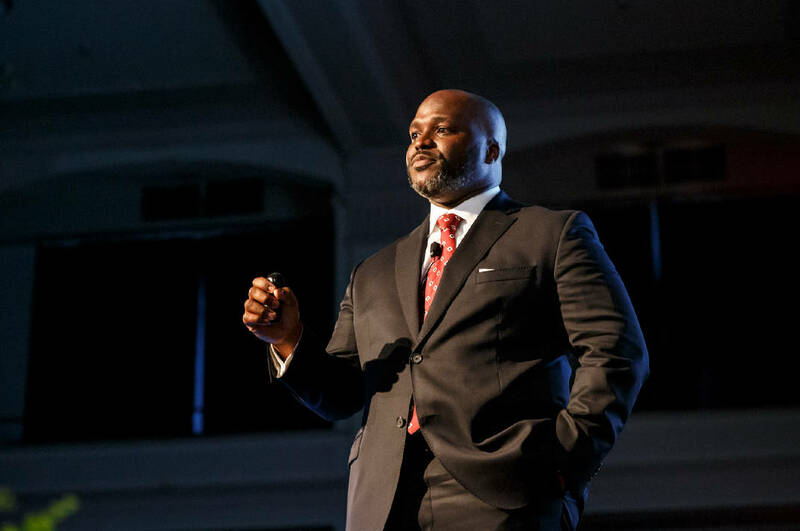 "There is work that we must do in the public education space, and ultimately the work that we do will prepare our students for post-secondary [opportunities]," Johnson told the crowd gathered at Chattanooga School for the Arts and Sciences. "That's going to take all of us working together to fulfill that promise." Coppinger said Johnson was "the right man at the right time" to address the problems that have plagued Hamilton County's schools, including poor performance on state tests and a lack of community trust. "I truly believe we have the right man at the right time to move this school system to a place it's never seen itself at before," Coppinger said. 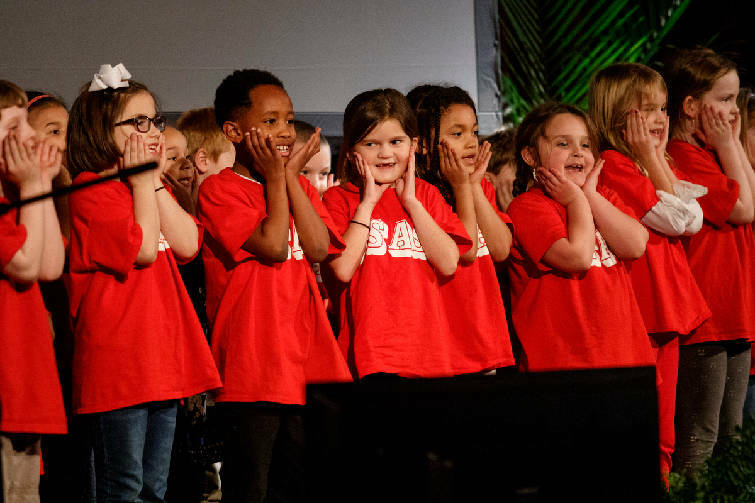 Children from CSAS perform before a "State of the System" address at Chattanooga School for the Arts and Sciences on Thursday, Feb. 7, 2019, in Chattanooga, Tenn. Hamilton County Schools Superintendent Bryan Johnson shared the current state of the school system and his outline for the future in an address to the community. Gillenwater also expressed enthusiasm about the superintendent's leadership, which began in July 2017, just a few months before she arrived in Chattanooga herself. "We are in a moment. We are in a moment with this man," Gillenwater said. "I know we are in a moment that I hope lasts a very long time, not only with Dr. Johnson as superintendent, but for this district." Both also echoed Johnson's thoughts that it takes community effort and support to improve schools, something he said the district "can't do in isolation." "I think it is also a responsibility for all of us to be a part of this process," Gillenwater said. The Chamber and Chattanooga 2.0 have worked together to spearhead partnerships between the school district and local businesses, and Gillenwater's staff has been focused on supporting workforce and talent development locally. Coppinger emphasized the need for local government to work alongside schools and state government to ensure public education is invested in. After the address he acknowledged that it was time to support the district's goals. 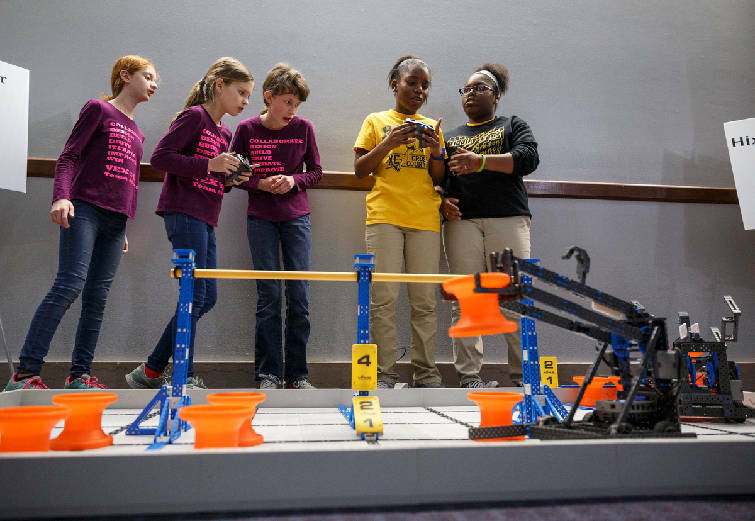 Students control robots at a demonstration table before a "State of the System" address at Chattanooga School for the Arts and Sciences on Thursday, Feb. 7, 2019, in Chattanooga, Tenn. Hamilton County Schools Superintendent Bryan Johnson shared the current state of the school system and his outline for the future in an address to the community. "We took advantage of a opportunity to be helpful with deferred maintenance," Coppinger said, noting last year's $110 million allocation from the county commission for school capital projects. "We need to turn our attention now to [Johnson's] goals and priorities and in turn give more resources for the classroom." Coppinger's praise comes as the school district has been working to strengthen its relationship with the county commission. The two met in January to go over Johnson's strategic plan, which was warmly welcomed by Hamilton County's state delegation, as well, last month. Coppinger and Johnson both openly emphasize their close relationship, which could prove helpful as the school board begins budget talks this month. Johnson's address at CSAS also featured dozens of presentations from schools and students across the district, from model robotic competitions to live performances by Normal Park and CSAS students. 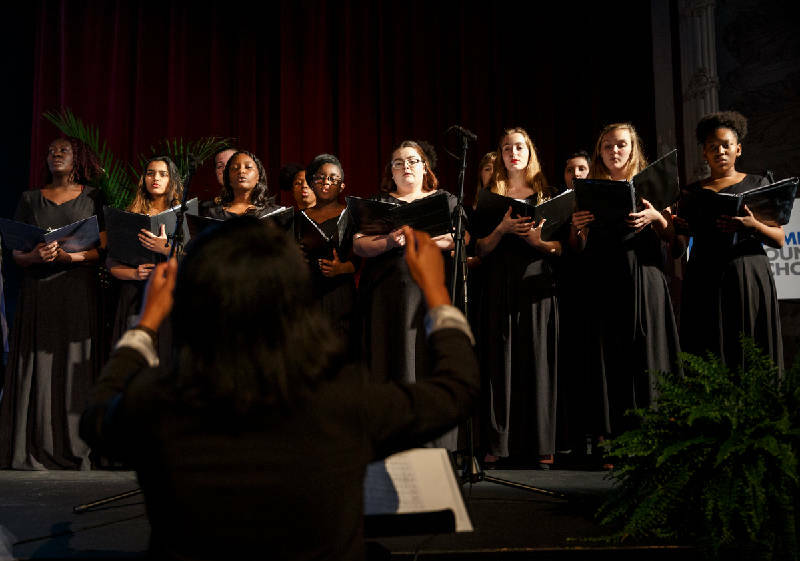 The CSAS Show Choir performs before a "State of the System" address at Chattanooga School for the Arts and Sciences on Thursday, Feb. 7, 2019, in Chattanooga, Tenn. Hamilton County Schools Superintendent Bryan Johnson shared the current state of the school system and his outline for the future in an address to the community.